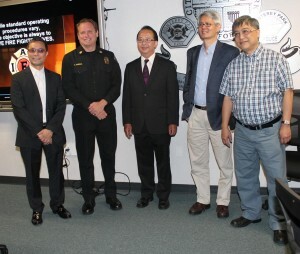 Professor Richard K K Yuen, Fire Chief Scott Haberle, S M Lo, Kwok L Tsui and Councilmember Peter Chan at the Emergency Operations Center on August 5th. 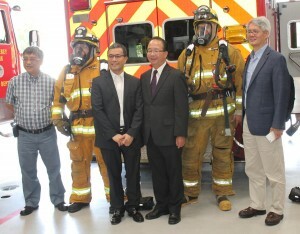 The delegation from China was part of an earlier exchange between the Hong Kong and Monterey Park Fire Departments. They asked the Monterey Park firefighters for additional information to help prevent the loss of life in their departments. 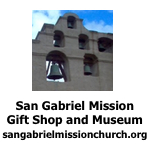 They recently lost two firefighters fighting a fire in a large self-storage facility located in the middle of town. 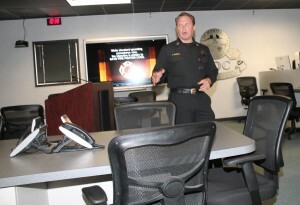 Chief Haberle explained the benefits of the Emergency Operations Center that was funded by grants and the City Council. They have three large wall monitors to keep an eye and ear on the local and world activities. The center is set up for use by all of the departments’ heads in case of natural or manmade disasters. The city will be using a new website system (VEOCI) that will notify him, his staff, the police department and the Council of any disasters. Their phone will get pictures of the event and they can track them. This Disaster Management System will cover all of Zone C in the Verdugo Dispatch Center. His department is having boot camps for EOC training for all city mid management and department heads to help in an emergency. Chief Haberle asked for a moment of silence from the firefighters and their guests to remember the two firefighters who died in Hong Kong. He has 25 years of service and firefighters don’t think about their own safety. They are not rescuing themselves. They can suffer from heart attacks and dehydration fighting fires. Any medical issues need to be addressed. They have a training film on how to get out of a building. EMS Justin Birrell teaches firefighters survival. Fire services have changes in the last 5 to 10 years. The International Firefighters Association, LODD, NIOSH, USFA and OSHA organization helped to develop this training program to save lives. 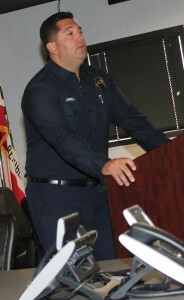 Monterey Park has between 50 to 60 firefighters on staff. They also use Mutual Aid for larger fires and some accidents. All of our firefighters are put through survival training. The firefighters are trained to save lives and property. He thanked Peter Chan and Scott Haberle for putting this event together with the Hong Kong associates. He showed a film “May Day” which is the code firefighters used when they are injured, trapped, use up their 45 minutes of bottled air or lost. They are trained using the phrase “GRAB LIVES” to remind themselves of each step necessary for their survival. Their information is necessary for the Rapid Intervention Crew to rescue them. This film presents various training situations and when to call for help if the firefighters cannot solve the issue within 30 seconds. The firefighters need to save their own lives too. The Monterey Park firefighters visit the Fire Training Center in Alhambra several times a year as part of their ongoing training. The guests from Hong Kong asked several questions on firefighter’s equipment. EMS Birrell thanked guests for their attendance. He said Chief Haberle placed flash drive for them in their coffee cups with additional information on resources that may help them in Hong Kong. 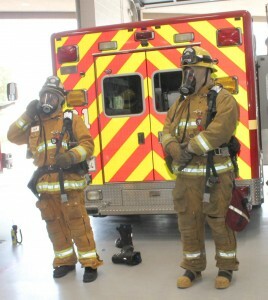 Firefighters Jon Chang and Ralph Weissenberg suited up for the guests at Station 61. Councilmember Peter Chan, Professor Richard K K Yuen, S M Lo, Kwok L Tsui posed with the firefighters for a moment in history at the end of the meeting.